Our approach to competitive differentiation and how it drives all of the decisions we make. If you're in the market for a new 360-degree feedback tool, there is no shortage of choices. In fact, a simple Google search for "360-degree feedback tool" yields dozens of companies in this space. How do you choose the one that best meets your company's needs? Further, how can you determine what sets a particular software vendor apart from the rest? Faced with so many choices it's no wonder that prospective clients ask us frequently about how we differentiate ourselves from our competitors. While we can easily point to a myriad of features that make the EchoSpan product unique, we know it's our framework for business and product development that makes us truly different. Our unique approach to continually improving our business is why we've grown to a client base of more than 4,000 companies over our 14 years in operation and a product that supports a wider array of client needs than any other tool. Rather than relying on one or two qualities or features of our tool to differentiate ourselves, we seek to differentiate ourselves by consistently and continually developing tools that provide value along four dimensions of value: Autonomy, Flexibility, Usability, and Reliability. In following these guidelines, we have created features and services that are valued by our clients and stand the test of time in an ever-changing industry. 1. Autonomy: The customer should be able to manage all aspects of their project without needing help from us. 2. Flexibility: The tool should give project managers choices in how the software works. 3. Usability: The software should be easy to operate with little training and have a modern, attractive appearance. 4. Reliability: The tool should work consistently and be available when customers need it. Reliability underpins the other three dimensions. 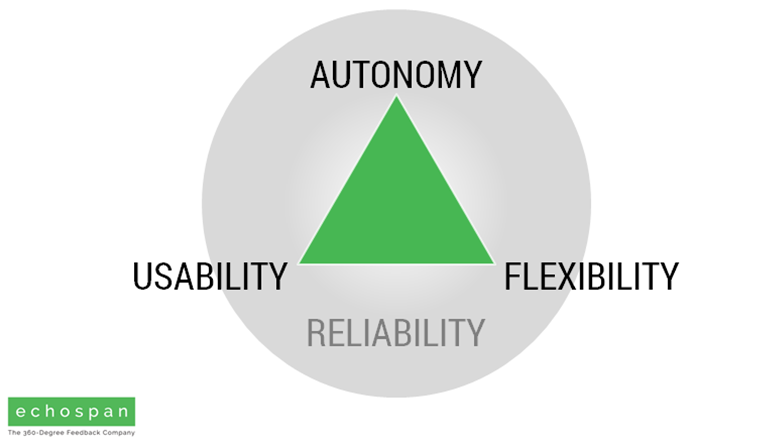 Consider the first three dimensions, Autonomy, Flexibility, and Usability independently for a moment. It's relatively easy for a software company to excel at two of the three, but usually it is at the expense of the third. For example, many companies produce tools that provide Flexibility and Autonomy, but are hard to use or aesthetically unpleasing. A common example of this is just about any large-scale HRIS system. They are designed to let administrators manage their employee population across a wide variety of business structures, locations and functions. However, very few HR professionals would commend them on their Usability as they are almost always famously known for their obtuse, dated interfaces and confusing visual organization schemes. Whenever we develop new features for the EchoSpan system, we make certain that they deliver value across these three dimensions. Reliability underpins our other three dimensions of value. If our tools are not available when needed and if their outputs cannot be trusted to be correct and consistent, the other qualities of the tool are devalued. Below are some examples of how our four dimensions of value manifest themselves in our product. Our tool strives to provide clients maximum autonomy in managing their projects. Our product is built with the belief that users should have full control over every aspect of their projects. For example, when building review forms, Administrators are able to select content from our library, use their own content, or a combination of both. Reviews can then be translated into more than 140 languages using automated or custom translations in just a few clicks. 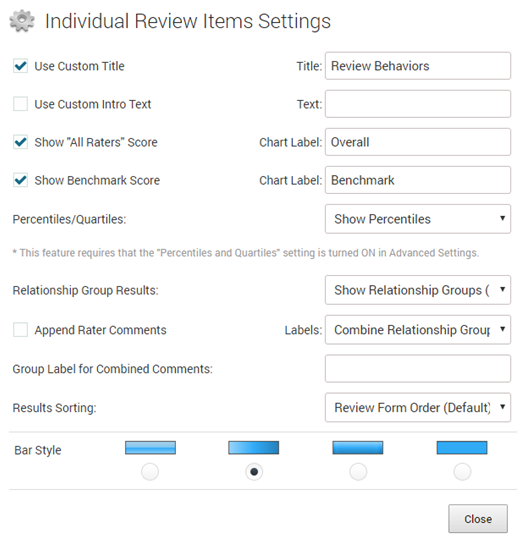 Rating scales, relationship groups, workflows and even email messages are easily customizable from within the administrative tool. Administrators are also empowered to manage all aspects of reporting including generating reports in batches, automatic distribution, and generating reports on-demand based on simple rules they set. Additionally, Administrators can easily configure automatic translations of the user interface, reports, review content, and instructional text. Most importantly, Administrators can do all of this without an EchoSpan employee intervening. We have designed our tool so that it is highly customizable by the user and adaptable to every client's needs. Our tool comes stocked with a number of pre-built report templates to pick from. 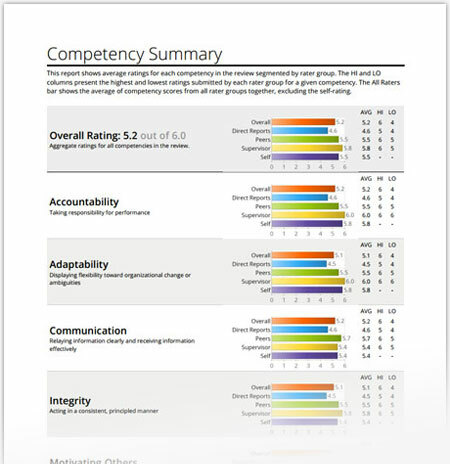 However, many clients wish to personalize their report templates for their organization's specific needs. So that clients have maximum choice in tailoring their reports, we provide a library of report components to select from and multiple preset templates for instant configuration of popular report options. With the EchoSpan tool, you have control not only over what pages and sections appear within your reports, but also the formatting, labels, and introductory text of all your report sections. Furthermore, the tool's multi-language capabilities allow users around the globe to respond to reviews in their native language. 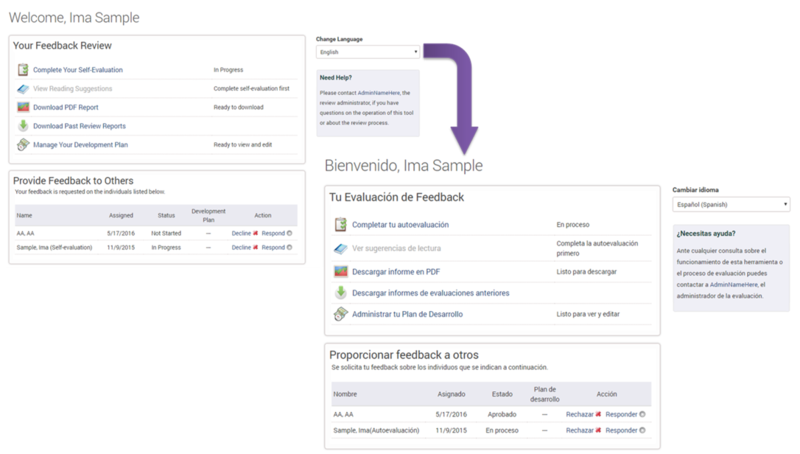 In just a few clicks, project administrators can convert a review form from one language to more than 140 others. 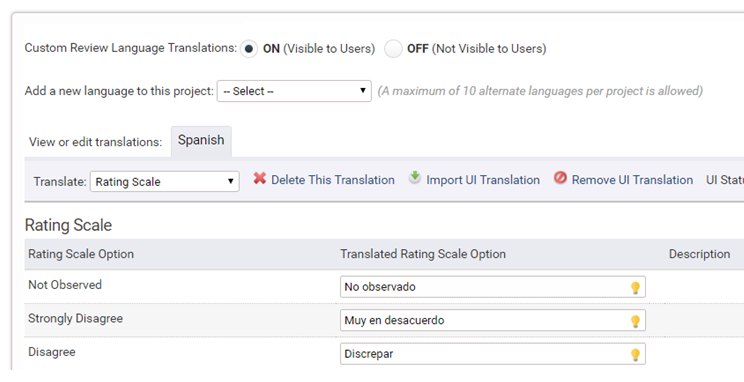 Review projects can be run in multiple languages simultaneously, as can reports. EchoSpan seeks to provide a feedback system that is visually simple and intuitive for any type of user. Final reports are designed to be read and understood with no training or instruction necessary for Administrators or employees. Our user interface is also designed to be used without any training necessary for end-users. Users can simply login to their review, select the language they would like to complete the review in, and select their responses. The idea is that our tool should be making the 360 review process easier, so users shouldn't need to take additional time to learn the tool that is supposed to be making their jobs easier. Autonomy, Flexibility, and Usability are key dimensions in delivering purposeful software, but all depend on the system's Reliability. EchoSpan's enterprise-grade application network ensures that our tool is available when customers need it. We pride ourselves on providing state-of-the-art at-rest and in-transit encryption to keep client data secure. Multiple application tiers and high-availability network hardware ensure the system is running when our customers need it to be. We also ensure our tool's reliability by keeping all our support staff in-house and providing users with a searchable knowledge base should they ever need support. It is one thing for a software company to deliver a product that solves an immediate problem and then tack on cool features here and there. However, without a clear vision that defines a product development path, the integrity and longevity of a product are hampered. We have seen many companies begin with a new approach to feedback, an attractive user-interface, or promises of lower costs through simplicity. But, without a true framework for product advancement, they quickly grow stale in the face of an industry that is advancing in several directions simultaneously. We believe our approach of continual improvement along key dimensions that matter to our customers is the clearest path forward.